This section covers the line where it runs on the North Viaduct which ends at Leicester Central Station. The map linked to is the Ordnance Survey map. To see an aerial photograph of the area covered by the map click on the tab labelled “Ordnance Survey” near top right of the screen and select ‘Aerial’ from the drop-down list. When finished with the map click on the browser ‘Back’ button till you return here. Unfortunately you cannot see this scene today. 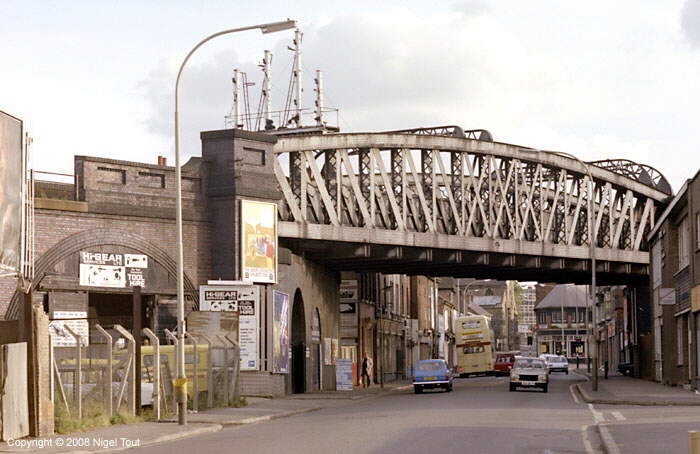 This is the GCR Leicester north viaduct in 1975. The perspective is strange since this is a panoramic picture assembled from two photographs, each itself taken with a panoramic camera. The viaduct is actually straight and level. The correct perspective can be achieved by printing the picture, holding it in front of the face and curving it so that it is the same distance from the nose along its whole width! Click here or on the picture to go a high-resolution image. Click here to go to an even higher-resolution, black and white, interactive panorama of this scene. Almost all of this scene has disappeared except for the length of viaduct on the extreme left, on the far side of the river, and an arch on the right, as shown below. This shows where the viaduct crossed Ravensbridge Drive at its junction with Saint Margaret’s Way, behind the photographer (the layout of roads around here was completely changed in the 1960s/70s). 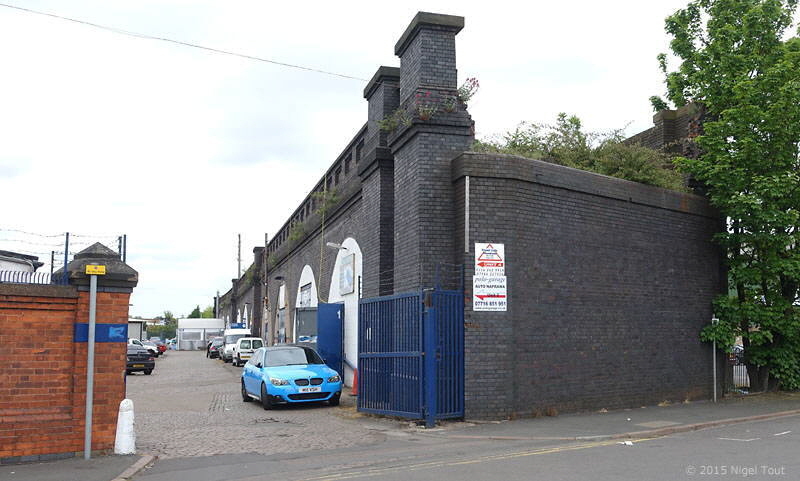 Leicester Central Station is about three quarters of a mile to the south (on the left) and the viaduct continued for another 100 yards north, now replaced by the car showrooms. Note the sales offices based in an arch of the viaduct. 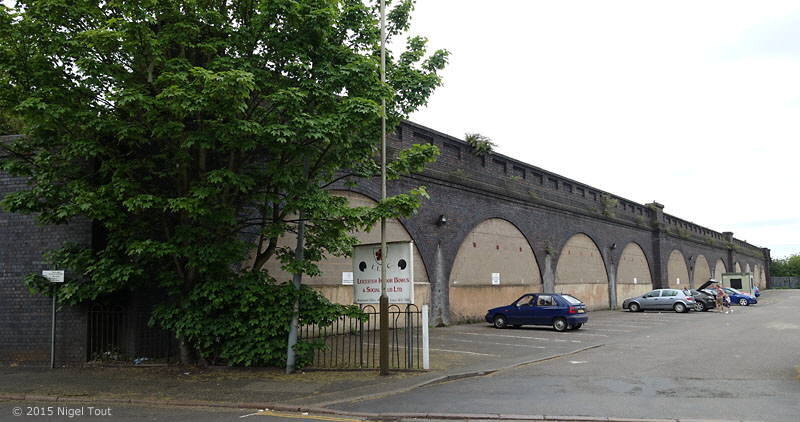 Update September 2018: Although work on road widening and other improvements are about to start here, the plans show that this short length of viaduct will not be affected. View of the end of the viaduct from Abbey Gate towards Saint Margaret’s Way. This is looking in the complete opposite direction to the photograph above. 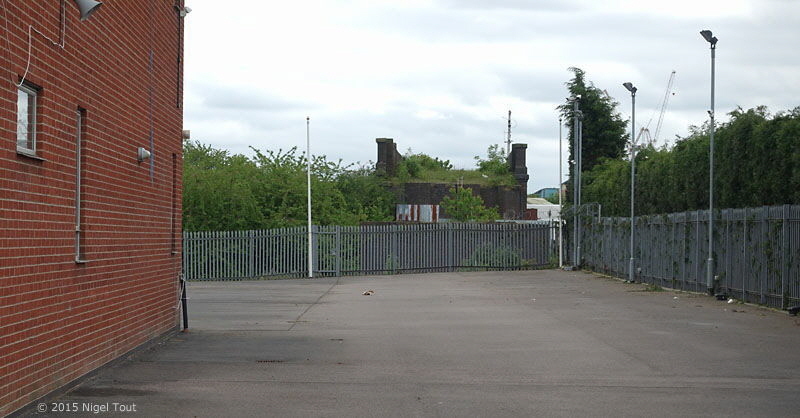 The roof of the car showroom can be see on the far left, then there is the van sales area, based on one remaining arch of the viaduct in the centre. 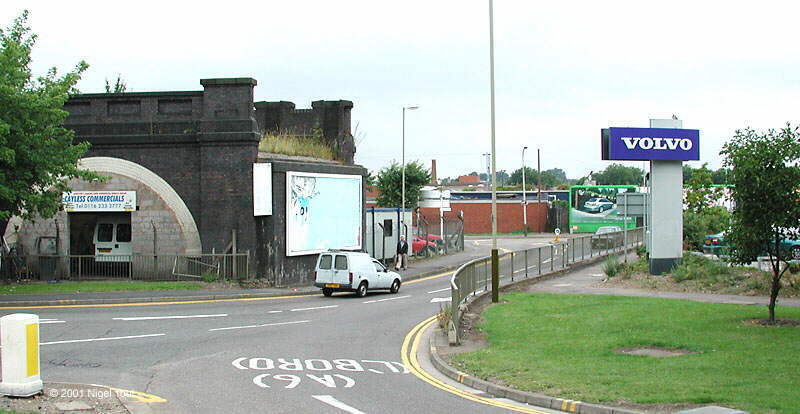 The section of the viaduct which continued southwards on the right was demolished in October 2004, as shown below. Looking south, the length of the north viaduct from here to the river has been demolished. For many years this was the site of a caravan sales but in 2015 this had relocated away. The end of the viaduct which is visible is across the River Soar, see below and still has a signal post in place. Panoramic view of the site of the bridge over the river Soar and the north viaduct, looking west. The section of the viaduct on the north side (on the right) has been demolished and the resulting rubble used for reinforcing the bank of the river, allowing the caravan sales area that was there to be increased a little. The middle pier of the bridge still stands in the centre of the river. The southern limit of the Northern Viaduct is now here at Slater Street, a hundred yards south of the River Soar. Everything south of here (to the left) has been demolished up to the Central Station. The cars are parked in what used to be part of Saint Margaret’s Pasture where there is now a leisure centre. Looking north at Slater Street, along the 11 arches of this section of viaduct. Seen from the other side most of the viaduct arches are used by businesses, and an old signal post sticks up on the viaduct in the middle distance. At Slater Street, looking south towards the station, where the viaduct has been replaced by more of the dreaded factory units. 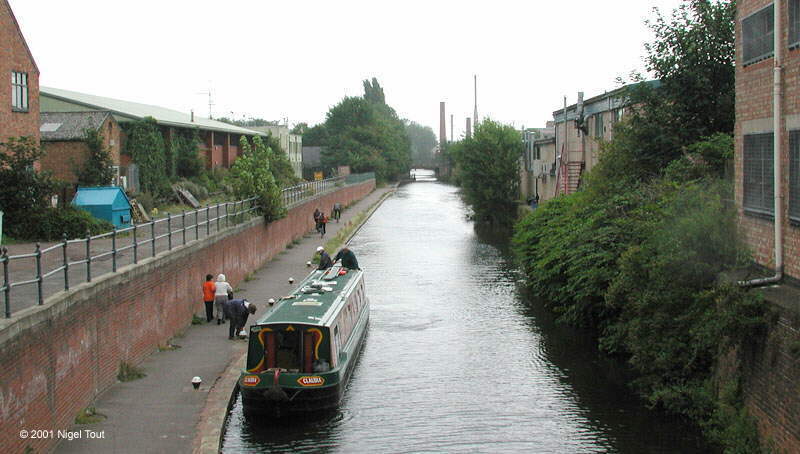 View of the Grand Union Canal at Frog Island/Northgate Street, looking north east. The Great Central Railway crossed here on a girder bridge which was just beyond the rear of the narrow boat. The base of the railway bridge across the Grand Union Canal is revealed in the blue bricks on the left, below the fire escape steps. Looking towards the road bridge linking Northgate Street (on the left) to Frog Island (on the right). 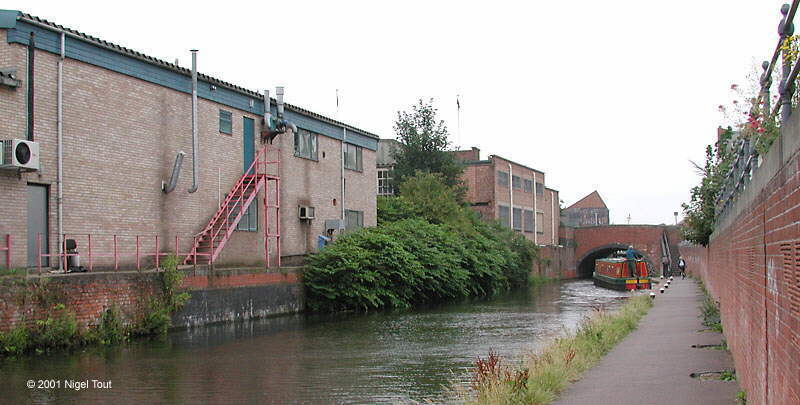 Along Northgate Street, a few yards from the canal bridge, looking towards Leicester Central Station. The end of the station viaduct can just be made out through the trees just to the left of the lamp post. A magnificent skew, bowstring girder bridge crossed here, as shown below for comparison. Unfortunately you cannot see this scene today. This is how the previous view looked in 1980. The only item which is the same between then and now is the bow-fronted shop near the centre of the picture. Photographs of this bridge during demolition can be seen in the Old Photographs, Demolition section. Looking northwards across Northgate Street. The Great Central viaduct would have gone through the middle of the car showrooms and the bowstring girder bridge would have passed over the road and the photographer. © 2001-2019 Text and photographs copyright Nigel Tout, unless otherwise indicated.